Preheat oven to 375°F. Heat oil in a large skillet over medium heat. Once hot, add onions and cook until they are soft, 3-4 minutes. Add ground beef to skillet with onions. Break the beef up as it browns and cook it for 6-8 minutes until it’s nicely browned. Add salt and pepper to your liking. Remove from heat. Lightly butter or oil a muffin tin. Open Pillsbury™ pizza crust and roll out lightly. Cut dough sheet into 9 even pieces and press into the muffin tins to form crusts. Fill crusts with the beef mixture. You can stuff them full. Bake cups at 375°F for 16-18 minutes until the cups are browned and cooked through. Remove from oven and sprinkle with cheese. Return to oven to melt cheese, 2-3 minutes. When cups are done and cheese is melted, pop the cups out of the muffin tins. 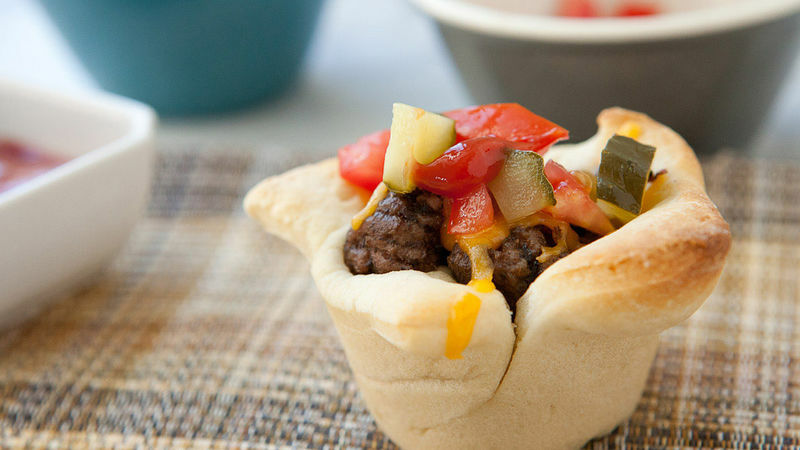 Garnish each cheeseburger cup with diced tomatoes, pickles, ketchup and mustard (or serve condiments on the side). Serve while warm!